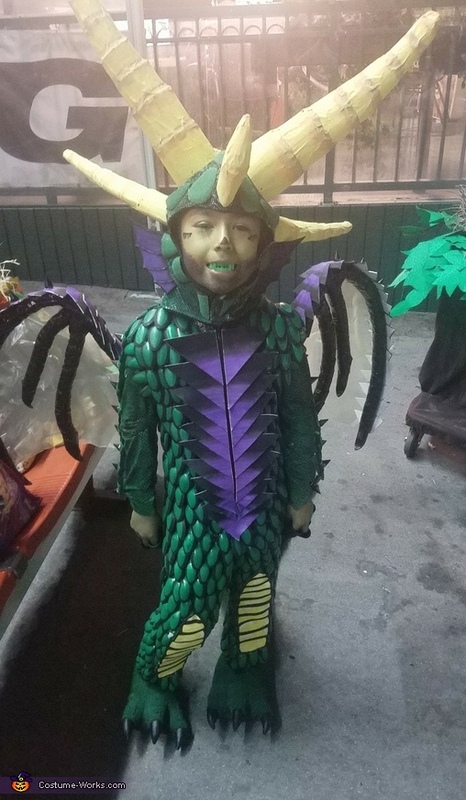 I made this costume for my son Damian he is 7 years old.I got the idea from Pinterest but I decided to get a little creative and make it out of spoons to make the scallop look for the body. I first cut the spoons to then spray paint them and last hand paint the black outline in each spoon. I glued them one by one to a body suit I had made with a tail. we made the wings from wire, pool noodle and duct tape. The horns were made from cardboard and paper mache I then sowed it to a headpiece. I had a lot of fun creating this for my son to enjoy.